This month I have three shows in one week, starting off with Alvvays at the Fillmore! Yeah, it seems excessive maybe, but in my mind they were all must-see. In some ways, Alvvays was the least “must see” of the three. I’m not like a super devoted fan, but I really like their music, and I thought they would be fun to see live. It turns out, I was right! If I go to a show with a friend, it’s almost always Alex. We met at SUNY Purchase in the 80s, and we’ve been hanging out ever since he moved to SF in the 90s. Just thought I’d do a little introduction, since Alex has appeared in previous posts, and will surely show up in many future concert reviews. We decided to meet at Japantown, which is basically across the street from the Fillmore. Alex wanted to go to a cool stationery store named Maidō, and we both wanted to eat noodles. Alex suggested Marufuku Ramen which was a few steps away from the stationers. I won’t go into detail, but the food was fantastic. We both had a pork based soup with lots of noodles, pork bellies, vegies, etc. It was to die for – so tasty. Definitely would recommend (if you are not vegetarian). Then we bopped over to the Fillmore. I feel like the Fillmore is a special venue, and I was ready for the full dimensional experience of R&R history, nostalgia, and of course getting to see some live music in a relatively intimate setting. I exchanged pleasantries with a cute greeter in a top hat, and Alex grabbed a shiny red apple. We decided to check out the balcony, at least for the warm up band, so we could relax for a bit. We found a couple of chairs with a decent view, and waited for Nap Eyes to take the stage. I had listened to a few cuts from this Canadian quartet on Spotify and was not too impressed. But they took the stage at the Fillmore and launched into a Lou Reed-esque number that frankly sounded pretty damn good. Singer Nigel Chapman’s voice sounded eerily like Lou. The next two songs were similarly pleasant, and I was kind of into them up to that point. But then the familiarity devolved into boredom, and I decided that they were derivative and not very interesting. I got up and took a walk around the venue, and checked out the floor area. I came back and informed Alex that we should move to the floor now – it was filling up, and now was the time to stake out good real estate before everybody crowded the floor for Alvvays. We listened to the last few Nap Eyes numbers from the floor. In their final song, their earnest strumming and crooning gave way to a discordant instrumental. The music got louder, faster, more chaotic, and the riffs clanged against each other. I actually felt that was the best, most unique part of the set, and thinking maybe they should just stick to that kind of sound, instead of a pleasant Lou Reed/Feelies sound-alike band. But obviously, Nap Eyes should play whatever makes them happy. Nap Eyes said goodbye, and we stood there talking for what seemed like a long time, waiting for Alvvays to take the stage. This was a sold-out show, and the audience was pretty pumped when Molly and the band took the stage. Let me just get out of the way the fact that it feels very much like Molly’s band, and the other players are the side people. I’ll also be transparent and admit I don’t know the names of the other players. 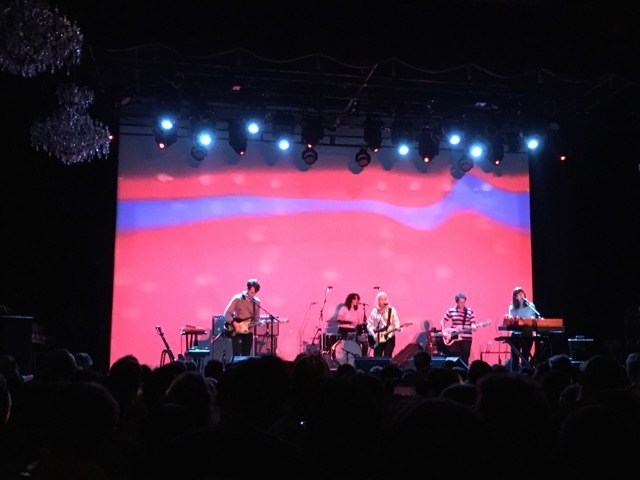 They’re all quite good, but since Molly does all that lead vocals, is standing in the center stage with the spotlight glittering off her sparkly gold blouse, it’s easy to assume that Alvvays is just a vehicle for Molly’s vision, but I don’t know that. They certainly play well together, and it may be that they’re content to let Molly be in the spotlight, while the rest of them focus on their music, who knows. 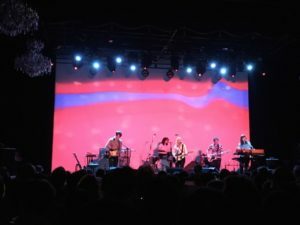 I have both the Alvvays albums, and they’re great – 100 percent filler-free indie pop music with killer hooks, gorgeous vocals, and tight musicianship. I’ve only had the new one, Antisocialites, for a few weeks so I’m not as familiar with the songs, but it’s equally as good as their self-titled debut. As far as I’m concerned, they played all my favorites from both albums, and I was totally satisfied. Marry Me, Archie was of course a big crowd-pleaser, and it came near the end of the set. Plimsoll Punks was a favorite, too. I was so glad they played Forget About Life, which is the last song on Antisocialites, and one of the most poignant. It starts off contemplating suicide “I thought of going in the lake and swallowing” and ends up asking “Do you want to forget about life with me tonight?” There is a dark vein in Molly’s songwriting that provides a counterweight to her crystalline voice and effervescent melodies. I didn’t find a whole lot of debauchery, but it was well worth making the trip to SF to see this talented band.